The Texx Team currently consists of more than 160 people with a shared vision - giving our clients consistent quality. As a wholesale second-hand clothing supplier, every member of our young and energetic team knows that the only way the system can work is if our clients can rely on us to provide clothing which meets their parameters for success every time. This means that proper training and extensive experience in the skills required to judge the sorting of used clothes is something which all of our team need right from the start. It sounds like it should be simple. But when it's your money on the line, we know you need to be able to trust that judgement implicitly. Whether it's sorting second-hand clothes bales or interacting with our customers, our team works together to get the job done right. We hire people from every walk of life. All they need is a firm belief in recycling, hard work and professional service. Dedicated - something we look for whenever we hire a new team member is a solid work ethic. Passionate - it might sound like a strange word to use, but our team are passionate about used clothes. We're saving the planet, after all! Detail-oriented - by both training and inclination, every member of our team has the eye for detail needed for sound quality judgement. What makes us different from your standard wholesale second-hand clothing supplier? From the very start, Texx Team was built around the idea that every single member of our team should be treated with the same level of respect as the company's owners and founders. With a shared mission and principles, it only makes sense. As a wholesale second-hand clothing supplier helping the world preserve its resources, we're striving for change in all that we do. We believe that should start with the way in which we work together. Do you have what it takes to join the Texx Team? Are you hard working and dedicated? Are you a big believer in recycling? Do you have a keen eye for detail? And/ or the physical strength and skills needed to safely move heavy second-hand clothes bales? We might just want to hear from you! 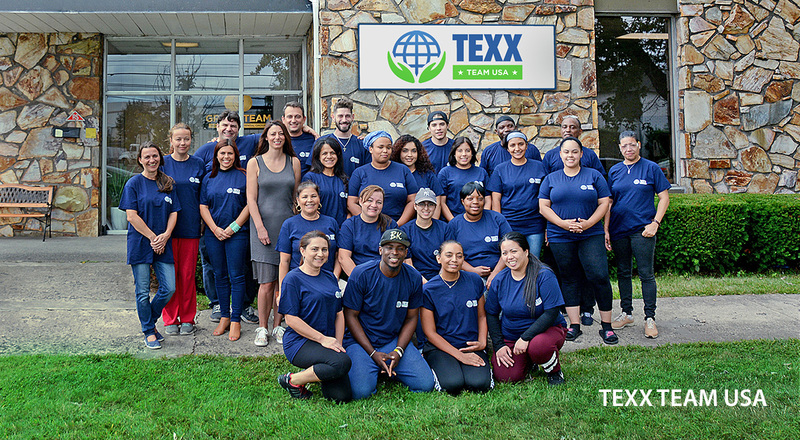 Because of the company's ongoing growth, Texx Team is often recruiting. Keep an eye out for our adverts when the time comes. Our current main sorting hubs are in Varna, Bulgaria and Carlstadt, New Jersey, USA.